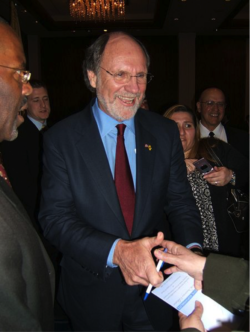 After more than five years, the book is closed on the case of Jon Corzine. There is no justice. We’re going to dive into some skeevy financial history today by way of spotlighting a major investing opportunity of 2017 — about which more shortly. Corzine is a poster child for the “financialized” U.S. economy. It was under Corzine’s tenure as CEO of Goldman Sachs that the company laid the groundwork to go public in 1999. That was the climax to Goldman’s decades-long transformation from a staid partnership in which the partners put their own money at risk… into a too-big-to-fail “vampire squid” that put taxpayers’ money at risk. His work at Goldman done, Corzine then jumped into politics — becoming first a senator from and then governor of New Jersey. In 2011, Corzine blazed new trails in financial shamelessness when in a matter of days his brokerage, MF Global, collapsed in a heap. MF Global was a storied firm with a lineage going back to 18th-century England renowned for its conservative portfolio approach. Then Corzine became CEO in early 2010 and instantly transformed it into an exciting go-for-the-gusto outfit. In the firm’s trading account, he made huge bets on European government bonds. The bets quickly went sour. To meet the margin calls… he raided customer accounts to the tune of $1.6 billion. It took more than two years before MF Global’s customers were made whole — including Gerald Celente, the pugnacious author of books like Trends 2000 and a regular on the TV interview circuit. We told the story at the time: Mr. Celente was accumulating physical gold by buying gold futures through MF Global and then taking delivery. For touching the brokerage industry’s third rail… Corzine experienced a shock no worse than a bit of static electricity petting the dog on a dry winter day. Corzine and other MF Global executives settled a civil case with customers last year for $132 million. Impunity, thy name is Jon Corzine. Gerald joined the Agora Financial team back in August. We wanted him on board because of prescient calls he made like that one… and how he anticipated gold’s huge bull run in the first decade of this century… and how he foresaw the 1987 stock market crash. To say nothing of a plain-spoken, take-no-prisoners attitude befitting a child of the Bronx. Recall the broad outlines of how the housing bubble burst: Wall Street took “subprime” mortgages taken out by borrowers with a history of poor FICO scores… and packaged them up into securities that were peddled to big-bucks investors as AAA-rated and ultra-low risk. Goldman Sachs, by the way, was a key player in that trade. Emails made public after the Panic of 2008 revealed many Goldmanites knew these investments were trash: “How much of that s****y deal did you sell?” said one. 2017 will be the year subprime auto securities go south, says Gerald. At a time when the auto industry is patting itself on the back for another year of record-high sales, reality is about to intrude — good and hard. The credit-reporting firm Experian says nearly 23% of all U.S. auto debt is subprime. And another 22% is “nonprime,” taken out by customers with less-than-pristine credit. Now… as we’ve said in the past, the auto loan market isn’t anywhere near the size of the mortgage market. Subprime auto loans won’t take down the system the way subprime mortgages did nearly a decade ago. But they will have an impact on many financial firms and on the automakers. He’ll unfold this map and lay it out on the table for you to see during a live event next Thursday, Jan. 12, at 7:00 p.m. EST. It won’t cost you a cent to access; we ask only that you shoot us your email address so we know how much server space to set aside. Here’s where to sign up. To the markets… which can scarcely rouse themselves to react to the monthly job numbers. At last check, the Dow was up nine points, at 19,908. Treasury yields have backed up a bit, the 10-year at 2.41%. Gold has backed off a bit, the bid at $1,176. The job numbers were mediocre. The wonks at the Bureau of Labor Statistics conjured only 156,000 new jobs for December — less than expected, and barely enough to keep up with population growth. The unemployment rate ticked up to 4.7%. The bigger story might be wage growth; average hourly earnings jumped 0.4%, the second such gain in three months. 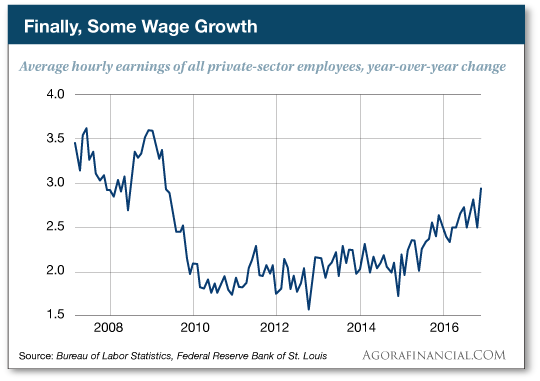 The wage figures have been rising steadily for two years now, and that will likely reinforce the Federal Reserve’s intentions to raise interest rates three times this year. Back in the real world, where many jobless people gave up looking for work long ago and where part-timers want a full-time gig… unemployment as calculated at Shadow Government Statistics is 22.7%. If you want to look on the bright side, that’s the lowest this figure has been since October 2012. The big move in the currency markets is the Chinese renminbi — which just registered a record two-day gain against the dollar. It’s not an organic move. Rather, the People’s Bank of China is cracking down on speculators betting the renminbi will fall. If you read the financial press, the story is that the PBOC wants to demonstrate who’s in charge and that it won’t tolerate wagers against the currency at a time Chinese growth is slowing and China’s debt burden is rising. But around here we can’t help wondering if the Chinese hope to fend off President-elect Trump’s warnings about labeling the country a “currency manipulator” as soon as he takes office two weeks from today. That’s something the Obama administration threatened regularly, but never pulled the trigger on. Velocity is back in our mailbag: “Dave, thank you for the timely response to my question about the relationship of consumer sentiment (via indexes like the University of Michigan survey) and the demand for money,” a reader writes. “‘At any one time, there is a given total stock of the money commodity… There is, actually, no such thing as “circulation,” and there is no mysterious arena where money “moves.” At any one time, all the money is owned by someone, i.e., rests in someone else’s cash balance. Whatever the stock of money, therefore, people’s actions must bring it into accord with the total demand for money to hold, i.e., the total demand for money.’ (Man, Economy and State, With Power and Market: Scholar’s Edition, pp. 760–1). The 5: What happens in a hyperinflation? At such a time, we suspect “consumer sentiment” would be in the dumper… even though people would be furiously exchanging their paper money for anything tangible, even if it’s stuff they neither need nor want. Heck, we don’t need to engage in hypotheticals: Inflation as measured by the consumer price index peaked at 14.6% in March 1980. The University of Michigan was already doing its survey in those years. It bottomed at 51.7 in May 1980 — a record low that still stands today. “I think people should take responsibility for their own health,” reads an email of the sort we often get when we spotlight a biotech investing play — as we’ve done a couple times this week. And on the topic of a blood-thinning drug we discussed yesterday, another reader writes: “How about a different blood thinner that works well, has virtually no side effects, only costs a few cents per dose and has been around for a long time. It’s called nattokinase, available from any serious supplement company. Or eat enough of a Japanese staple food called nattō (it definitely is an acquired taste!). “Of course, Big Pharma can’t make obscene profits from nattokinase because it is a naturally occurring food extract or nutraceutical, nor will it sell expensive newsletters. I dare you to print this one! The 5: Good on you. As it happens, our growing Health Sense Media division is all about furnishing information about health solutions outside the realm of conventional medicine. Many weeks, our Saturday edition republishes an essay from their e-letter Living Well Daily. But the reality is that you (and I) are in a minority. The government and the sick-care industry have conditioned vast numbers of people to consume a diet high in carbs and low in saturated fat — a sure recipe for chronic cravings, insulin resistance, the whole nine yards. They’ve also convinced vast numbers of people that the only good exercise is the kind that gets your heart rate above 85% of your maximum for long stretches of time — which is a sure disincentive to do any kind of exercise at all. P.S. The fact of the matter is that huge sums of money change hands every day in the biotech industry… and if you know how to position yourself, it’s possible to capture as much as $393,000 in 12 months. It all comes down to a few “magic dates” each year. And one of them’s coming up in another 23 days. Follow this link and follow the money.